As a treat for Shirley's last visit to London, and following our morning visit to the Turner Watercolours exhibition we had lunch in the Rex Whistler restaurant at Tate Britain. I was able to make the reservation on-line and also made a request to have a place in the restaurant where we could sketch. They did us proud and we sat next to one another on one of the banquette seats at the side and were able to have a good view of the room, its amazing mural around all the walls and the diners. Besides providing us with a set-up to sketch, what I also appreciate in restaurants like this one is that the tables are not too close together so that there is a pleasant hum in the background of people talking but you can still hear yourself and your companion speak. My sketch is done on a double spread in my A4 Daler Rowney sketchbook - which means the sketch is about 11.5" x 17". It was completed using my media of choice - pen and sepia ink and coloured pencils. 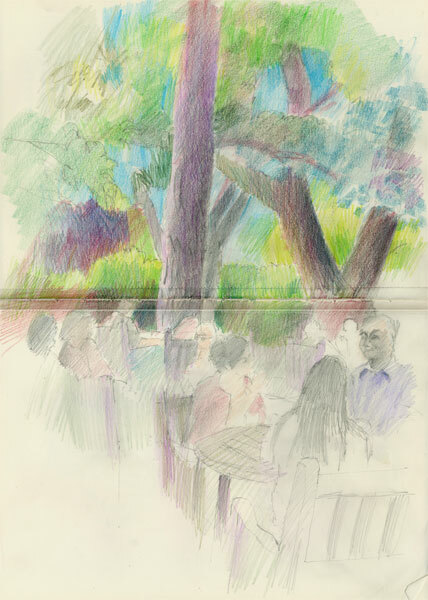 Afterwards we returned to the Colour and Line exhibition and did some sketching from facsimiles of Turner originals. This was my effort - which was taken from A Bridge in the Grande Chartreuse 1802. Click on the image to see a larger version. Turner often sketched and did colour studies on coloured papers or toned grounds. Why not try drawing from Turner for yourself? You can see more of the Turner collection which is online here. You can also see the online version of the recent Drawing from Turner exhibition - which involved artists today drawing works by Turner. This page on the website talks about the tradition of copying by Turner and from Turner. After that I hit the bookshop, my wallet whined some more at me and then I toured round the Tate Britain galleries showing art from the 18th-19th Centuries - including works by John Singer Sargent and Waterhouse, Rossetti and Millais and Constable folllowed by a minor collapse on a sofa with a cup of tea in the Members' Room! And I now know where the sketching stools are kept! They're in a room opposite the entrance to the members' room! Rex Whistler restaurant - you can download breakfast, lunch and dinner menus! What do you do when you go to a large museum or art gallery? Just look at the pictures? Well, there's actually a lot of other sorts of activities going on in galleries. First off, galleries are great places to meet people and I'm now quite used to arranging meetings or interviews in galleries - although these are generally art-related and are also generally in one of the eating/drinking/relaxing areas. Apparently I'm not alone - I attended a focus group at the National Portrait Gallery earlier this year. We were all Members of the NPG and virtually all of us used the gallery's facilities to meet up with people in our respective fields. Last Thursday I was at the National Gallery meeting someone about a major project we're currently sizing and scoping. Afterwards I walked round the gallery and then sketched the activities I saw going on. There's lots of personal development and teaching that goes on in the Galleries too. Photography or the use of a video camera is banned at the National Gallery (but not all museums - check first) however it is possible to sketch and/or copy paintings in the NG and some other galleries. Some of them (eg the NG and V&A) even provide sketching stools free! I sketched one woman who was copying a Poussin painting. Below are the instructions for people wanting to draw or paint in the National Gallery. You can sketch throughout the Gallery. At busy times, we may ask you to move on. Please use a hand-held pad of paper with pencil, graphite stick or felt-tipped pens. Please do not use messy materials such as pastels, wax crayons, charcoal and fountain pens. 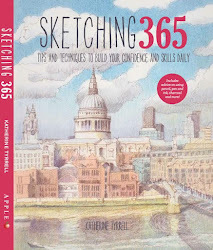 You may bring your own stool for sketching. We may ask you to move on if we feel you're in the way of other visitors. Copyists who wish to use paint or other oil/water-based media can ask for an application form from the Information Department. "The National Gallery probably employs more scientists than art historians"
It's also worth checking the education sections of any gallery's website. They also list events (workshops, seminars, courses, gallery talks/trails etc) for various age groups and backgrounds. Some are associated with a specific exhibition while others are related to the nature and scope of the permanent collection. In London, some charge a fee and some are free. Below are the education and events links for some of the most popular galleries and museums in London. Gertrude Jekyll (1843-1932) is a very famous English gardener and garden designer who lived at Munstead Wood in Godalming in Surrey. She originally studied botanical drawing at the Kensington Scool of Art and subsequently developed strongly held views on design, form and the use of colour in the garden and was an advocate for the Arts and Crafts Movement. When her eyesight failed, she switched to painting in colour in her flower beds instead and became a much revered and very successful garden plantswomand and garden designer as a result. Her house was designed by a young Edwin Lutyens (1869-1944) and completed in 1896 (see inscription left) while she designed the garden. The University of California at Berkeley holds digitalised drawings for a number of her gardens - including Munstead Wood in its Environmental Design Archives. Lutyens was known as the great English Country House architect - but he was also responsible for designing New Delhi! He met Gertrude Jekyll as he was establishing his practice and they collaborated together on the landscape portion of many of his country house commissions. His Lutyens bench (see left) can be found in many a country house garden. Below are just a few of the photographs I took - from top left in clockwise order, they are: the view from the Lutyens Bench in the North Court; the Tank; the garden below the North Court and Tank; the Nut Walk; the South Terrace and the Main Border. Click a photo to see larger images of a very wet garden! I sat on the bench in the corner of the Summer Garden to do the first sketch. It was a little bit difficult as I has having to hold my umbrella above my head with my left hand while balancing my sketchbook on my knees and drawing with my right hand! You can just see in my photo of the sketch made prior to getting the coloured pencils out that some rain drops made it through the paper prior to adjusting the angle of the umbrella. I found it very interesting using coloured pencils in the very damp atmosphere. The ones which are watercolour pencils had a much greater impact than usual. 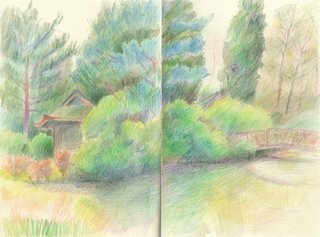 For my second sketch I found a small summer house which contained some chairs and used that to sit out of the rain and sketch the view along the pergola to the walk next to the main border which is famously planted in drifts of colours. The Main Border is approximately two hundred feet by fourteen feet and is backed by an eleven foot Bargate stone wall clothed with shrubs and climbers......The border itself consists of a colour scale at each end commencing wth plae blue. mauve, cream and white. As you get nearer the middle your eye is met by increasingly strong vivid yellow, orange and red hot colours. Many annuals as well as perennials are used. Each end has a yew hedge as background to help bring the colours out. Yucca, Bergenia, Sea Kale and Lyme Grass provide a variety of leaf textures. From "Munstead Wood - House and Gardens"
I came home with a fair bit of material in terms of sketches and photos plus a much better appreciation of the nature of the garden. I'll be using the material to work up drawings for exhibition and will add in a link to this post when they emerge. I spent yesterday with Julie Oakley of "One Mile from Home" and "Julie's Pictures". Julie has a new blog "A Family Portrait" devoted to doing portraits of her family - aiming for one per day - in the last year that all her childen are still living at home. I'd been hoping to meet up with Julie for some time and the Private View (yesterday) of the BP Portrait Award 2007 (exhibition opens today - 14th June) provided a great excuse! So we agreed to go but also to meet up for a mini sketchcrawl in Chinatown in Soho first and then have lunch. At 10.00 o'clock we set off from the National Portrait Gallery and walked round the back of the gallery, through Leicester Square and up into Soho so we could sketch Chinatown. We set up on the north side of Gerrard Street in the middle of morning outside Tai Kai Lok. Deliveries to all the Chinese restaurants which line both sides of the street were in full swing and we thought we'd done really well with our spot looking at the Chinese gates into Gerrard Street - with the Irish pub behind them - until the owner of the restaurant announced he needed to wash the pavement! At which point we retired over to the south side of the road to sit outside Loon Tao and sketched the view of the Golden Pagoda and Oriental Delight in the other direction. I decided Julie needed a sketch of her sketching and duly included her in "Oriental Delight" above! Soho is a great place to sketch in the morning - if you can find a place where your view is not obscured by delivery vans or people washing their pavement. I had a filthy great big white van behind Julie's head for most of this one hence the lack of development of the right hand side. Fortunately one which was going to park and obscure our view completely very kindly backed up and removed himself from our view. I didn't quite finish either sketch as I was working on a double page spread of my Daler Rowney sketchbooks which means each image is about 11" x 16". I took a couple of reference photo shots so will probably work on them a little more and then post the end results here as well when I've finished them. At midday we packed up and pootled back to the Portrait Restaurant on the top floor of the National Portrait Gallery for lunch (one of my very favourite places - we both had the Smoked Duck Breast Salad - yum yum!) and chin wagged our way through lunch and coffee and our respective lives, artistic training, experiences and ambitions! After the Private View, we wandered around the twentieth century section of the gallery getting inspiration for different ways in which you can portray people - always a joy. Then when the gallery closed we 'retired' down the road to the The Tappit Hen to enjoy a bottle of Rioja and do some more sketching...and Julie sketched me!. We finally went home at 8.00pm having had a thoroughly nice day. I think we may well be planning more days like this in future! Drawing people and delaying the cream tea! I did this very fast sketch yesterday of people in the tearoom at Biddulph Grange Garden - a National Trust property in the north west of England. Mother and I visited yesterday, very dull day and the cold weather has held back a lot of the growth but it was great for seeing lots of hellebores and the first shoots of the giant asiatic lillies which they grow there. Mother was very pleased as she got some seeds of the latter! Sketch is a double page spread in my Moleskine sketchbook. Mechanical pencil and just a smidgen of coloured pencil on top. Took between 5 and 10 minutes. Mother sorted out the cream tea which we were sharing and poured the tea while I sketched! (This was first posted in "Making a Mark" on 13th April 2006. This post indicates the contrast in weather between the two Aprils - last year the cold lingered long and the bluebells were delayed by about six weeks. This year it almost felt like June in April, closely followed by a May which was one of the most cold, wet and miserable on record. Such are the delights of the English weather and why 'changeable' is a word in much use during weather forecasts. 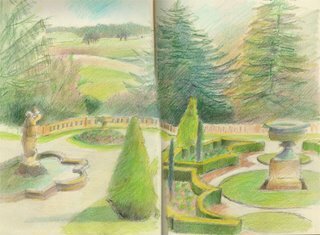 Last Saturday [see footnote], I sketched at Tatton Park - these are views of the rear of the recently restored Japanese garden and the view of the park from the Italian gardens just in front of the house. Tatton was one of those places I used to go when I was young - a special treat was rolling down the terraced lawns - the terraces were just wide enought to allow some speed to be generated and the rolling to be spectacular. Nowadays I'm rather less mobile and mother (in her late seventies) is even less so. For those who like visiting gardens but have difficulty walking, Tatton is an excellent place to visit as it provides electric wheelchairs of the sort you see many older people now using to do their shopping. Mother whizzed around gravel paths and on and off grassy banks in one - she even managed the steep slope at the side of the Italian gardens! Fortunately I managed to persuade her to sharpen all my pencils for me before she started getting too ambitious! 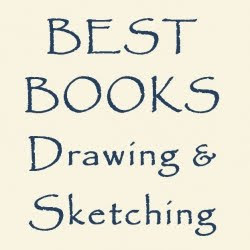 The sketches are graphite with coloured pencil in an A4 size Daler Rowney sketchbook - the one with a hard black cover and perforated pages. I drew most of it on site, and then completed a bit more in colour and tonal terms soon afterwards while the images were still fresh in my mind. Yesterday (the last day of April) was a glorious day - sunny and warm with a clear blue sky and excellent light which wasn't dazzling. Coming back from a meeting in Oxford, I decided to try and visit two places near the M4o that I'd been wanting to get to for some time, knowing full well that I'd do neither justice. This was very much a late afternoon 'scout round and decide how soon I want to come back if at all' visit! First I visited the National Trust gardens at Cliveden in Buckinghamshire. These are located north of Maidenhead and near the Thames just west of Heathrow. The wisteria was in bloom and looked great but there didn't seem to be many flowers out - it appears to be mainly a landscape garden. I did two sketches of the view from the Orangery Cafe and from the terrace at the back of the main house. Neither of them are up to much - mainly because I'd forgotten to sharpen my pencils in the sketching pencil case after my last trip out - and had forgotten to pack my sharpener on this trip. The sketch of the garden was supposed to be a double page soread hence the odd composition. Notice also the avoidance of much use of the colour green in the subsequent sketches (at top and bottom)! I then travelled on to Cookham, which is on the River Thames betwen Maidenhead and Marlow in Berkshire. The Cookham Festival is on at present and finishes on May 7th. I drew Fernlea, the birthplace and childhood home of Sir Stanley Spencer in the High Street (see top) before walking around the village to see various places which feature in his paintings. I now know where the gallery about him and his work is (and that it's currently being refurbished). I finished off by having dinner at The Ferry - and drew the diners. The RHS Garden at Wisley has a new glasshouse which next week will be formally opened by the Queen on 15th June 2007. Below is blog post originally posted in 'Making a Mark' a year ago on 7th June 2006 - updated with some additional links. Wisley is a 240 acre garden in Surrey which is the home of the Royal Horticultural Society. This is the organisation which runs the Chelsea Flower Show as well as a number of other shows, large and small, over the course of the year. 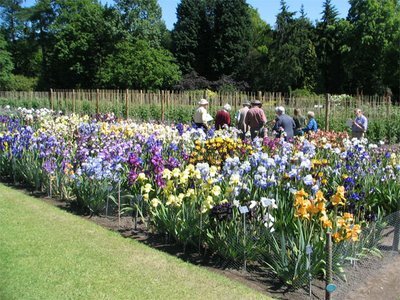 We visited Wisley last Saturday on the way home from the anniversary celebration in Hampshire - and I went to their Annual Iris Show and also saw the Iris Trial Beds in their full glory - with (I think) Iris Society members pondering the latest blooms! I was especially pleased as I love irises and managed to take rather a lot of photographs of all the different coloured blooms both indoors at the show and outdoors at the trial beds. Overall, during the visit I managed to fill all of one memory card - pulled out my spare and filled that one too! But I now have lots of reference images of flowers I love. The day was very sunny and bright - and the importance of trying to get photographs while flowers are not in direct sunlight was really brought home to me. The two photos of single blooms were taken late afternoon in the Country Garden area - with the blooms completely out of direct light - and it makes such a difference to the quality of the image. All the ones taken in full sunlight suffer from all the normal problems of high contrast. However, you choose where to go but you can't always pick your weather! I have an exceptionally boring 'plein air' sketch to show you - done over a cup of tea while "he who must not be bored while I sketch" continued to read Roy Hattersley's "The Edwardians". This sketch just goes to show why trying a double page spread in an A4 sketchbook when you've got 20 minutes to sketch is maybe not such a brilliant idea. It's a view of the people in the shade of the trees at one of the outdoor cafe areas where we were sat for our cup of tea (has anybody noticed how often tea gets a mention in this blog?) and it's unfinished. I did get some quite interesting optical mixes going and it did prove to be a fruitful study for the sorts of colours which might work for the trunks of very large pine trees! I never ever use grey or brown - all my grey and browns are always mixed from colours. The nearest I ever get to grey is greyed lavender! We had a wonderful day and I came away with membership of the RHS and rather a lot of new botanical art books which is my current bedtime reading - reviews coming soon! This is a view I recommend to anybody visiting central London armed with a sketchbook and a need to eat/drink and sketch. Yesterday morning I was interviewed a for a very interesting project which I'm participating in. I'm hoping to tell you all about it at some point - but not just yet! I suggested we do the interview in the coffee area of the Portrait Restaurant on the 3rd floor of the National Portrait Gallery to meet (nice and central and fairly quiet). Regular readers of my 'Making a Mark' blog may remember that the view from the windows is also great as night. 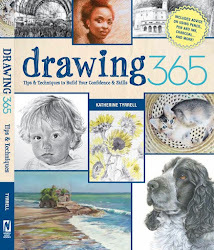 See "Drawing, Tea and DVDs at the National Portrait Gallery". This a very famous view of a World Heritage Site and one of the most striking buildings in London - which has been painted by Antonio Canal (Canaletto). On Saturday, we went for a walk around the south end of the Isle of Dogs, starting at Burrells Wharf where Isambard Kingdom Brunel's Great Eastern was built and launched and walking east along the Thameside Path and then looped back through the Mudchute , which is a 40 acre urban Farm - the largest in Europe. The photo on the left is of Brunel at the launch of the Great Eastern - the largest ship in the world in the mid nineteenth century. Part of the slipway is still preserved. Half way along our walk was Island Gardens and right across the river from island Gardens is this view. This is the site of the former Greenwich Palace, one of King Henry VIII's favourite hunting lodges. The layout and the architecture of what exists on the site today was designed by Sir Christopher Wren - with significant assistance from a number of other prominent architects. The hospital closed in 1869 and the building became the Royal Naval College - opening in 1973. The navy finally departed from the site in 1998. The building at the front of the site is now known as the Old Royal Naval College and is managed by the Greenwich Foundation and is home to part of Greenwich University. The Queens House and Maritime Art in Greenwich. The Queen's House can be seen between the two towers at the base of the hill in Greenwich Park. It houses the Maritime Art Collection in the National Maritime Museum - which contains a number of views of the site including the one from the North Bank of the Thames by Canaletto (click on the painting for a larger image). As I sketched pleasure boats came past with varying degrees of noisiness but they were all completely upstaged by the ship you can see in my photo. We were completely amazed to see the Gothenborg coming past, especially when the ship fired its cannons as it came past the Cutty Sark. This ship is an exact Swedish replica of an 18th century Dutch East India merchant vessel which sailed out of London 262 years ago in 1745. It was built in 2002 and is the only ship like it in the world. It's just been on a visit to London. For anybody reading this who is not aware, the Cutty Sark (a very famous - and fast - tea clipper located just to the west of the Old Naval College) was severely damaged by fire on 21st May 2007. You can see the masts of the Cutty Sark on this video of the panoramic view of the Maritime Heritage site from where I was sitting. We could see the blackened timbers from the other side of the river. Visit this link if you want to find out more about what happened and would like to consider contributing to its restoration. The Visitor Centre has now reopened. 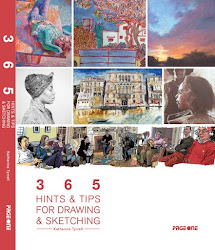 "He who must not be bored while I sketch" and I were following a walk set out in a rather interesting book of walks in London called "Walking London's Docks, Rivers and Canals" by Gilly Cameron Cooper. It appears to be a very reliable book with a number of excellent walks. On Friday we went to the Royal Botanic Gardens at Kew. I can highly recommend Kew Gardens in June - it was full of flowers associated with Georgia O'Keeffe - arum lilies, poppies and irises. There were also masses of flowers more commonly associated with English Gardens - such as peonies and roses - although both of course came from elsewhere originally. We were fortunate to have sunshine for the visit which after the amount of rain we've had recently was very welcome - however it does make photographing flowers more difficult. It's so much easier getting good photos of flowers when they are in some sort of shade as the image then has the shading associated with the structure of the flower as opposed to that associated with the direction of the sunlight. These lovely arum lillies were in a very nice shady spot. The Waterlily House is host to a wonderful variety of waterlilies including the giant waterlilies Victoria amazonica and Victoria cruziana which get bigger and bigger over the course of the summer. Personally I really like the shapes and colours of the flowers and leaves at this stage of the summer. It is now also the place to see lots and lots of different varieties of chillis with absolutely fascinating names! After last summer, Kew has apparently decided that it's going to have a Mediterranean summer. This seems to be focusing on the different sorts of plants that it's now possible to grow given the extent of climate change to date. You can even listen to a podcast if you visit the website! all things botanical - you can see the range of botanical books produced and sold online by Kew at Kewbooks [www.kewbooks.com]. growing waterlilies - I've included a link below to a society dedicated to water gardening.